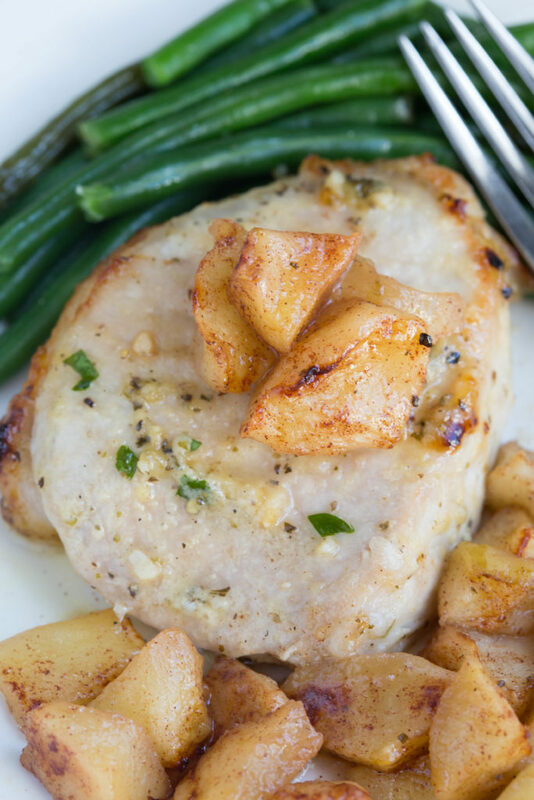 These sheet pan brown sugar pork chops are perfect for fall and are an easy dinner recipe to make as a ministry meal or for a quick weeknight bite. After a long hiatus, I’m finally back and bringing you this incredibly easy dinner recipe that’s perfect for the season and made in 20 minutes or less! 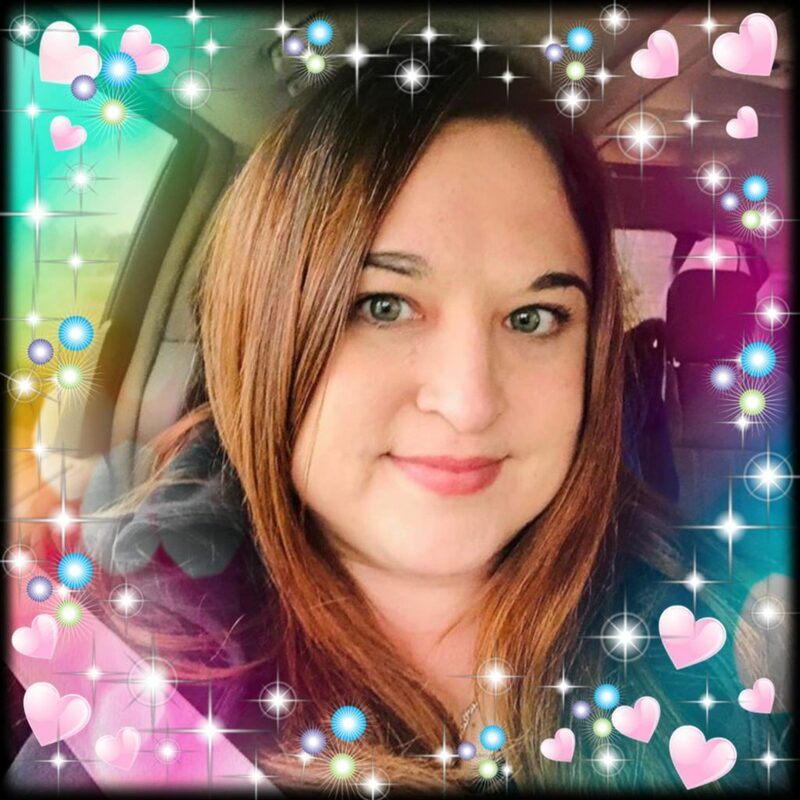 Things have been rough on the home front, and I needed to take some time to relax, regroup, and get my faith and my health back on track. I’ve been making a lot of sheet pan suppers for my family because that’s all I have the energy for, and baked pork chops like these have been in the monthly rotation. Getting myself back into some sort of routine has proven to be especially difficult, and I’ve only survived because of my faith in God, easy dinners, and ministry meals provided by my friends and family. Ministry meals are basically food that is prepared for friends, family members, or acquaintances in need. They’re meals made simply to show someone you care. Whipped up a few freezer meals for your bestie who’s about to have a baby? Ministry meals. Made soup for an elderly lady down the street who’s sick with no family around? Ministry meal. Received a plethora of casseroles from all the ladies at the church when your Mom smashed her arm to bits? Ministry meals. Ministry meals are actually one of my love languages, and I jump at the opportunity to make them at any given chance. I’ve even joined the meal ministry at our church! So…how many not so tasty ministry meals have you received in your lifetime? Yes, I know these meals are made from the heart, but sometimes they just miss the mark, ya know? No, not everyone can be a chef (or food blogger), but I feel it is important to serve meals that are actually edible. Tried and true recipes like pot roast and pasta are always awesome, but they’re also what everyone else makes. I mean, of course people will be grateful for the 3 pot roasts and 6 spaghettis they receive, but there’s no need to put added stress on the people you’re ministering too. 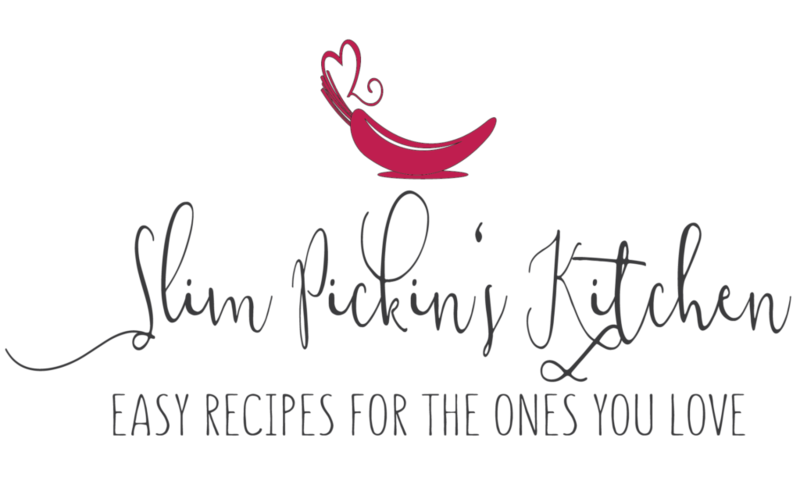 Spice things up a notch and send a supper that’s seasoned with an extra dash of love! 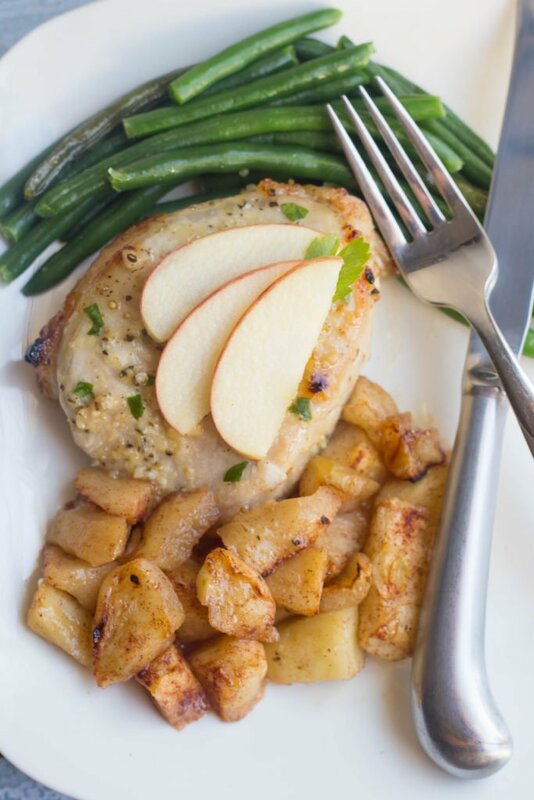 These Sheet Pan Brown Sugar Pork Chops w/ Apples and Green Beans would make the perfect ministry meal! They’re simple, seasonal, sweet, and savory and will be a welcomed change from most ministry meals on the menu. The best part? 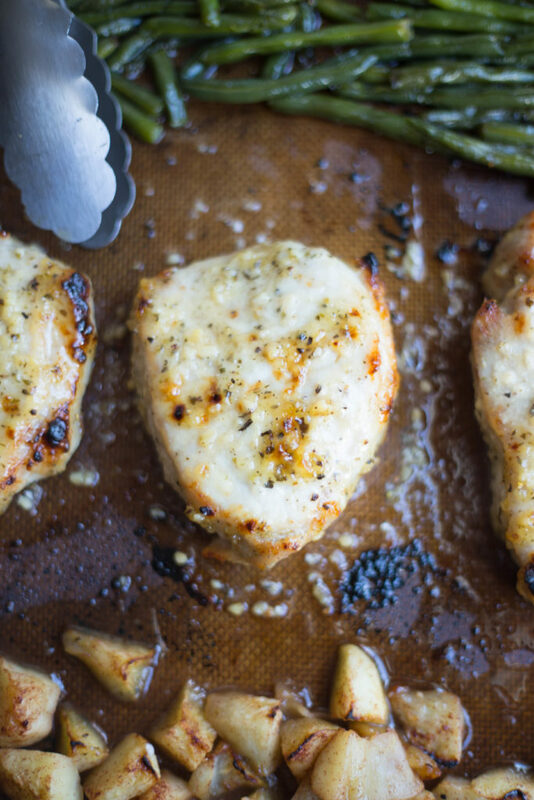 This whole meal is totally made on one pan! Now, most meat recipes call for you to sear them in a pan beforehand. That’s totally something you can do, it will definitely add more color and flavor, but it can sometimes also cause the pork to be overcooked. That’s not what we’re going for here so I opted to leave searing out of the equation, but if you do happen to sear them, make sure to skip broiling them after! I also used frozen whole green beans because I find that they are just as delicious as fresh and they, quite frankly, are easier to deal with. You can choose fresh beans if you can find them in the fall or Brussels sprouts or broccoli. 3/4 tsp Herbs de Provence or Italian seasoning, thyme, etc. Preheat oven to 400 degrees (F) and line a baking sheet w/ parchment or a silicon baking mat. Toss all of the apple ingredients together and place on one section of the prepared baking sheet. In a small bowl, combine garlic, brown sugar, dried herbs, onion powder, salt, pepper, and olive oil and stir until it forms a paste. 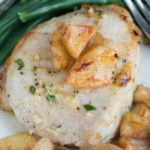 Slather both sides of the pork chops in the mixture and place them on the baking sheet beside the apples. Add the green beans to the remaining section of the baking sheet and toss w/ a bit of salt and pepper, to taste. Bake for 15-17 minutes. Switch oven to broil, and broil for an additional 3-5 minutes or until golden in color and an internal meat thermometer reaches 145 degrees (F). Keep a close eye on them b/c all ovens work differently! Sprinkle w/ chopped parsley, for garnish. You can totally sear these for 2 minutes on each side in a hot pan before you place them on the baking sheet to get more color on the chops, but make sure you don't broil them afterwards if you choose to sear them first! Need more ideas for Ministry Meals?